Opera Mini, the mobile web browser designed to conserve data, has finally received an update that gives it the native interface it deserves. This new interface, which has been completely overhauled, makes Opera Mini feel closer in style to its bigger brother, the main Opera mobile browser. 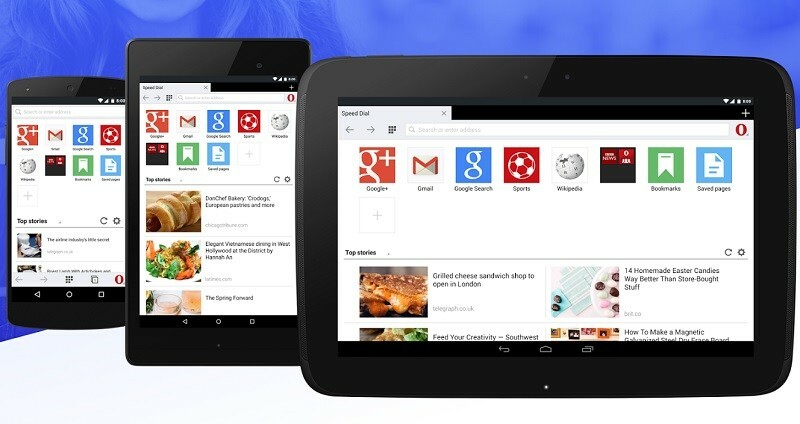 One of the main advantages to the revamped Opera Mini interface is that it scales across devices of all sizes. This means that Opera Mini now looks great on high resolution smartphones like the Galaxy S6 and LG G3, and the app is also now properly compatible with both small and large tablets. Some of the core features from the main Opera browser have transitioned across to Opera Mini, including a simplified main menu with redesigned Speed Dial shortcuts, a private browsing mode, and an updated Discover feed. Specific to Opera Mini, the browser also now features a data counter, which tells you how many megabytes you've saved while browsing the web. Unlike most other Android web browsers, Opera Mini compresses all the information that it receives before it is received, which conserves mobile data and helps out those with capped data plans. Opera Mini 8 is now available to download directly from here, and with its redesigned interface, it's well worth checking out if you haven't done so already.